Sometimes the easiest way to figure out what you want is to consider what it is that you do not want. This often eliminates a number of your options, leaving you with what you are aiming to find in the first place. You know, the good old process of elimination! When you know you need a roof installation or roofing repair completed on your Alpharetta home, it is likely that you will have no idea where to start. Afterall, Georgia is full of roofing companies, all promising the same things, offering extremely competitive prices. But not all of these companies are the same. If you want to ensure that you are going to end up with exactly what you pay for as well as a roof that will last you for years to come, it’s important to know what the signs of a bad roofing company are. Continue reading below to learn more! They don’t show their face. If a roofing company can’t send someone to your home to speak with you one-on-one about the job you would need them to complete, it’s time to kick them to the curb. Companies who simply leave roofing quotes in mailboxes, or who call and leave voicemails for you are not in the customer service business, no matter how much they claim to be. A good roofing contractor will be present and available to answer all of your questions about your repair or roof installation. They tell you to get your own permit. This is a red flag! If a contractor wants you to get your own permit, this means that the company is probably unlicensed and additionally uninsured. If you were to get your own permit, this means that you would be completely liable for any injuries or accidents that occur while your roofing job was being completed. Best case scenario, you’re going to have to pay a huge settlement. Worst case scenario? You will lose your home! They don’t inspect your attic. Contractors should always inspect the underside of your roof before any work begins so that your quote is as accurate as possible. If a roofer doesn’t complete this process, chances are you could potentially be charged a ton of additional fees by the time your roofing job is complete. They provide no proof of insurance, licenses or permits. Under no circumstances should you ever hire a roofing company that does not have proof of insurance, licensing or permits. Should you choose to do so, you are putting you, your family and your home in major danger. Additionally, there is no reason to hire a roofing company without these credentials as there are plenty of companies in Alpharetta who do. Don’t settle for less than you deserve. They need more time than normal. If a roofing company tells you that your roofing repair or installation will take more than a few days, there’s something suspicious going on. Normal contractors have a fairly large crew to help them complete the job, making it a fast and easy process. Not to mention, you don’t want people crawling all over your home for upwards of a week…that’s just eerie. They aren’t planning on disposing of leftover materials and trash. A good roofing company will make sure that when they leave your home, it’s in better shape than it was when they initially arrived. A bad roofing company will leave trash, debris and scraps all around your property, telling you that it’s your responsibility to dispose of it. Make sure the company you hire is prepared to clean up any and all messes they make and leave your roof and your home looking spick and span. 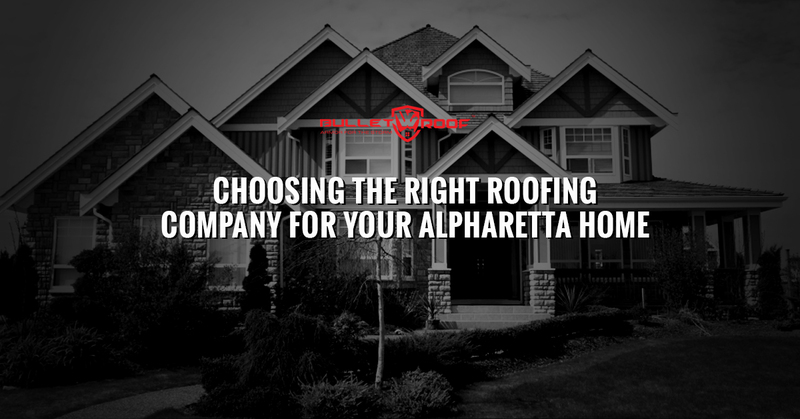 Hire an Alpharetta roofing company you can trust. If you live in the Alpharetta area and you are looking to find a roofing company that can live up to all of your expectations and more, it’s time to call BulletROOF®. We are Georgia’s most trusted roofing contractors! Our talented team of roofers will complete the job better than you ever imagined they could and can provide you with all of the documentation of permits, licensing and more before you ever agree to hire us. Call our roofing company today to learn more about what we can do for you and your home.